How do I move the shield icon to my Firefox toolbar? 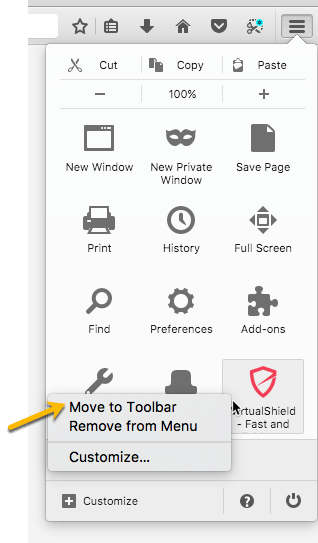 Can't see the VirtualShield icon in your Firefox toolbar anymore? If you already enabled it, but don't see the icon on the right of your address bar, it's most likely "hidden" in the Firefox menu. This article will help you get it back. There is also an animation at the end of this article showing this process. First, please make sure the VirutalShield Firefox Extension is installed AND enabled. Look for the VirtualShield icon and right click on it. Select the "Move to Toolbar" option. That's it! The VS icon should now be in your Firefox browser, right next to the address bar. For more information on how to use the VirtualShield Firefox extension, please check out our article, Getting Started with the Firefox Extension.